It seems each summer there are always plenty of baby showers around and this year is no different. 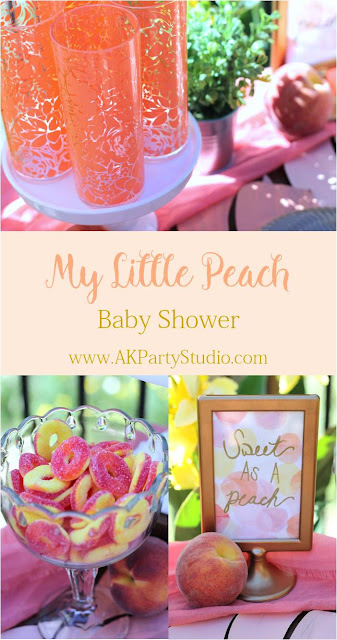 I know several ladies who are expecting, a fun way to celebrate in the summer is hosting a "My Little Peach" baby shower for the momma-to-be. I hosted the event in my backyard, it was a small intimate lunch for a few close friends of the momma. The decorations were simple, yet pretty. The color scheme was pink, peach and gold. This darling print was super easy to make. I took scrapbook paper that matched the theme colors, cut to size and hand wrote a sweet message in gold metallic to match the frame. Simple, easy and quick, love those projects! I ordered this beautiful tissue tassel garland by Glam Fete, in an array of pinks and peaches. I love using tassel garlands, they are inexpensive, fun and come in a wide range of colors to match any theme. I wanted a runner of some kind to add additional color and texture to the dessert table. I could find exactly what I wanted so I created it with palm leaves and craft paint. I took each palm leaf and painted them with two different peach/coral shades. They turned out really cute and added just the right amount of color. These darling cookies by P.S. Sweets were a hit, such cute designs that matched everything perfectly. I love how they turned out. We served peach iced tea in these darling floral glasses from Target. So refreshing on a warm summer day! You can't have a peach party with out some peach rings, placed in a beautiful bowl they look much more elegant than they actually are. Love when that happens. I love hosting parties outside in the summer, the natural elements of flowers, greenery and the warm weather create a perfect atmosphere for any event. As a thank you guests were given these yummy "Georgia Peach" candles from Bath & Body Works, and in case you were curious, yes it smells amazing!! Even in the summer I still love to burn candles, this fragrance is perfect for the season. This was such a small intimate event that we didn't mail out official invitations. 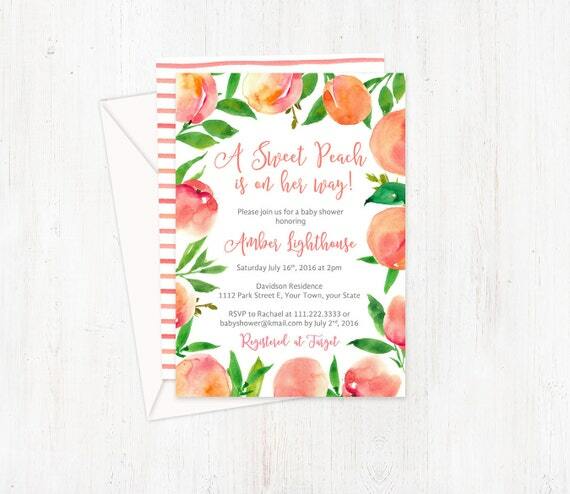 However, if you are looking for a cute peach inspired invite to match this theme, I highly recommend checking out this invite by Dulce Grace Paperie.